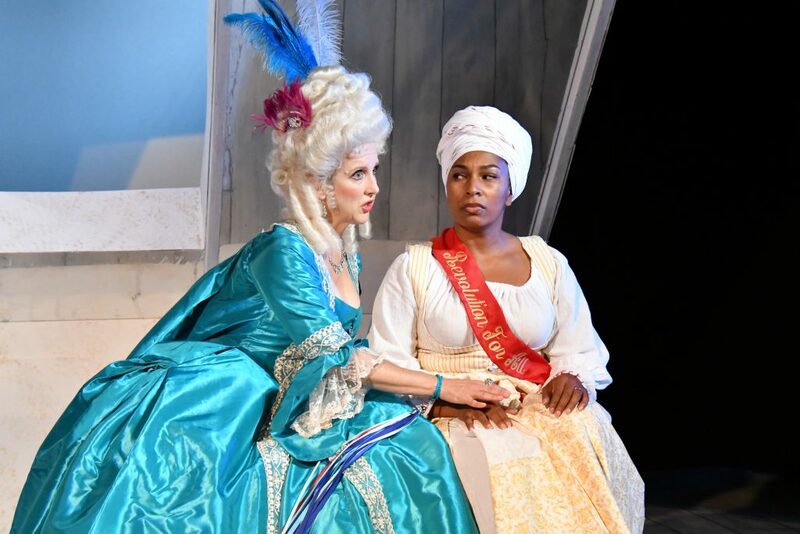 Lauren Gunderson’s “The Revolutionists” features an all women cast and crew and dives into the question: What would the world be like if more women’s stories were told? Brainy Gunderson creates an unlikely quartet of female historical figures—prominent, subversive women headed for the guillotine during the French Revolution. She updates their conversation with modern style and a few profanities. Voila! … a hilarious debate over women’s rights and what it means to be a citizen. Taking inspiration from the French revolutionary motto liberté, égalité, fraternité, Gunderson confronts “sisterhood” (or sororité) and how women shape history. She answers boldly by declaring women could have changed the French revolution. No ambiguity here. Director Susan E. Evans makes a swift correlation to the Supreme Court hearings of Brett Kavanaugh and the rescue mission by brave Professor Christine Blasey Ford. 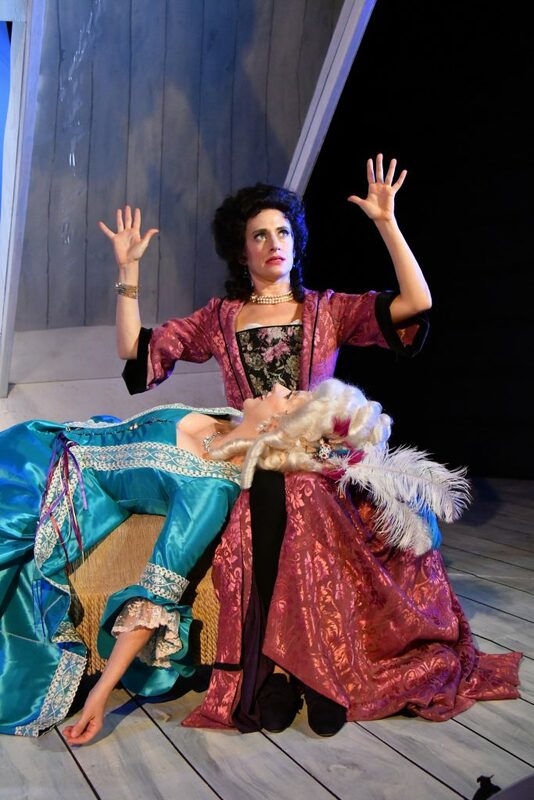 Revolutionary Parisian playwright Olympe de Gouges (electrifying Sarah Mitchell) struggles to write a defining story to fit her explosive times. Exasperated, de Gouges is interrupted by three women—all with ideas and demands. First, Marianne Angelle (stalwart Kimberly Ridgeway), a Haitian abolitionist, demands that de Gouges write pamphlets fighting against slavery. Next Charlotte Corday, the famous assassin of Paul Marat shows up seeking “last words” for her upcoming debut at the guillotine. Hilarious Corday (Heather Kellogg) describes her murder of Marat as “the stabby stab,” my favorite line. Deposed Queen Marie Antoinette appears in search of better press and a few “tweaks” to history. 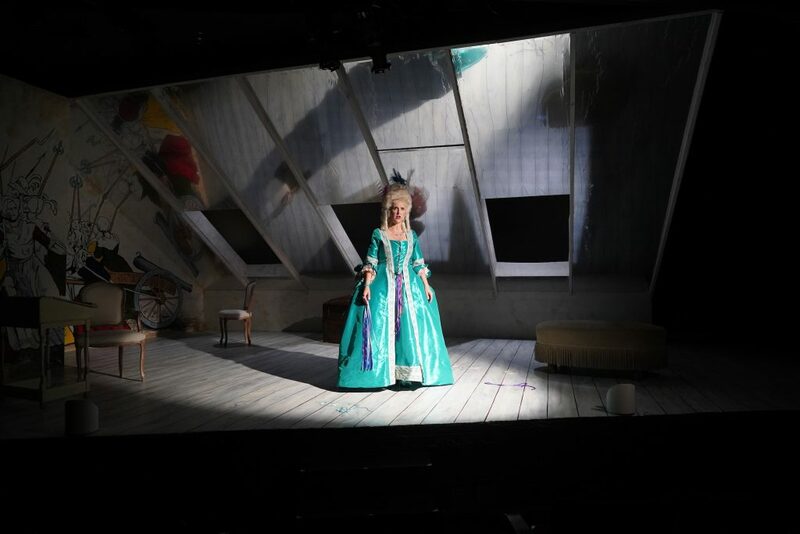 Suzie Shepard sparkles as a bubble-headed Marie Antoinette with shrill shrieks and cartoon mannerisms. Placing these four bright, ballsy women together makes for hysterical, wacky debates; but Gunderson floods the dialogue with so many clever jokes, it’s impossible for the cast to hit each one. Some gags fall flat because the ladies are rushing to their next lines. The quartet muscles through an array of topics: violence, terrorism, feminism, compassion—more than enough for us to chew on. De Gouges finishes her work, and one by one, the women meet their fate at the guillotine, their stories encapsulated in de Gouges’ play. 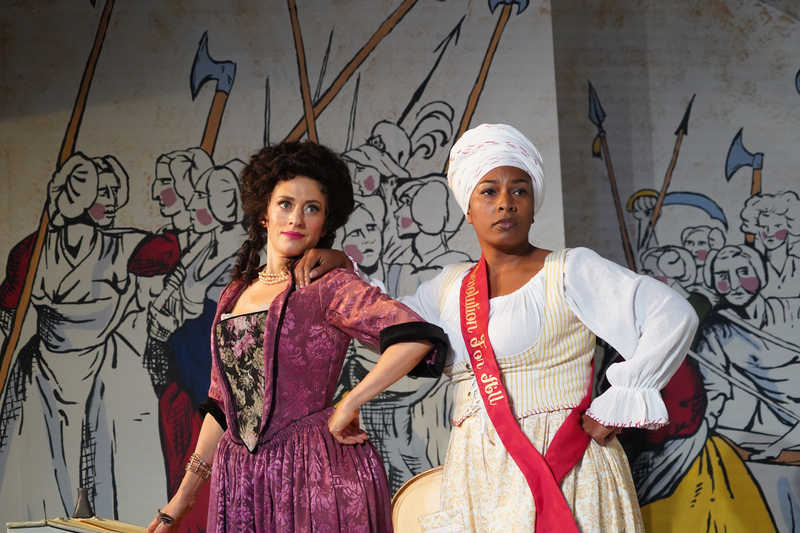 Town Hall’s production of “The Revolutionists” speaks exclusively with strong female voices, a refreshing change. Who better to tell this dynamic revolutionary story? “The Revolutionists” delivers a fitting twist to today’s headlines. Cast: Sarah Mitchell, Kimberly Ridgeway, Heather Kellogg, and Suzie Shepard.